Within this article, we provide evidence of the ability of claraT to robustly identify the biologies underlying several Hallmarks of cancer. This is shown by a retrospective case study in malignant melanoma which represents poor prognostic disease (5-yr survival 15-20%). We applied claraT to the TCGA melanoma dataset to identify targetable biologies within both the study cohort and individual tumor samples. This white paper retrospective study demonstrates how simultaneous analysis of multiple gene expression signatures (GES) (n=35 in this study) can identify robust biologies through consensus readouts. 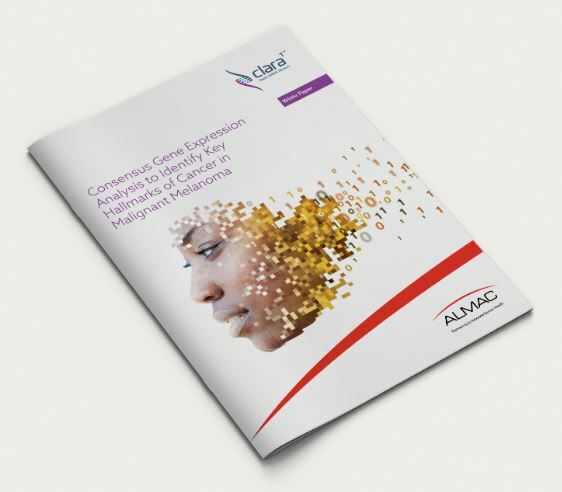 Almac’s claraT reporting solution may have value in the identification of reliable biomarkers for clinical trials and could inform combination strategies for targeting key biologies.